In cold process soap, we recommend using it at 5% or below. Because of the rich dark color, it may have an effect on the color of your final product, depending on how much you use. In the photos below, the recipe contains 5% tamanu oil. Notice the bright yellow color that the oil makes! 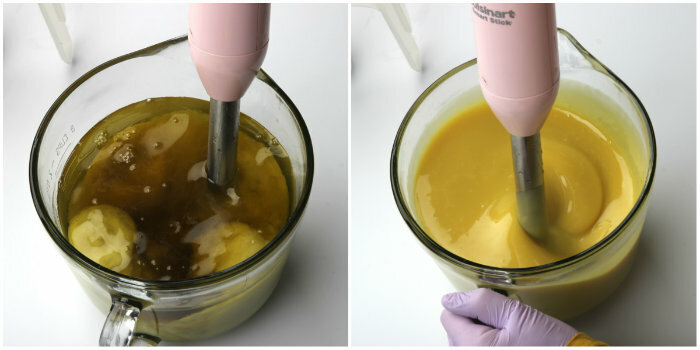 The yellow color could be combated by using titanium dioxide, but you may want to avoid cool tones when using tamanu oil in cold process soap. 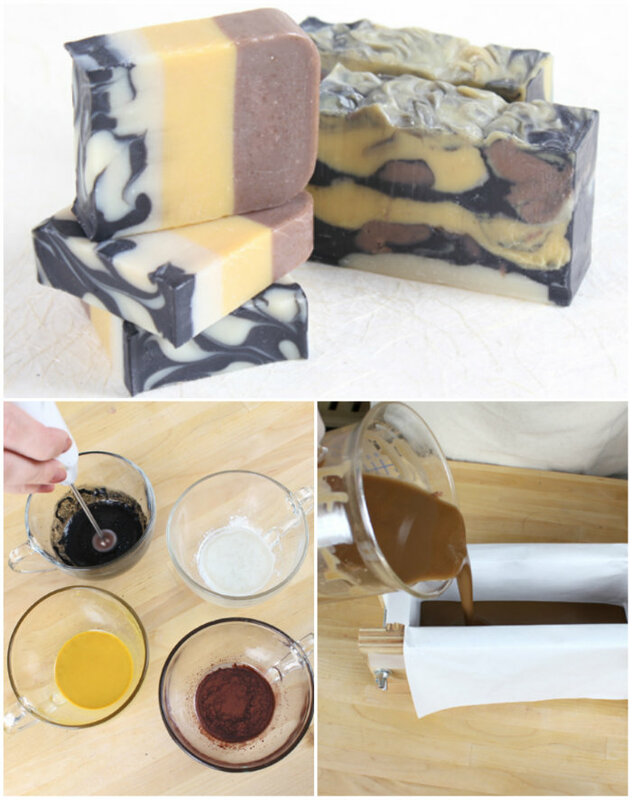 If you’re looking for a cold process recipe with tamanu oil, check out the Man Soap with Tamanu Oil Cold Process recipe. Scented with Leather Fragrance Oil, this soap contains orange peel powder for extremely gentle exfoliation. 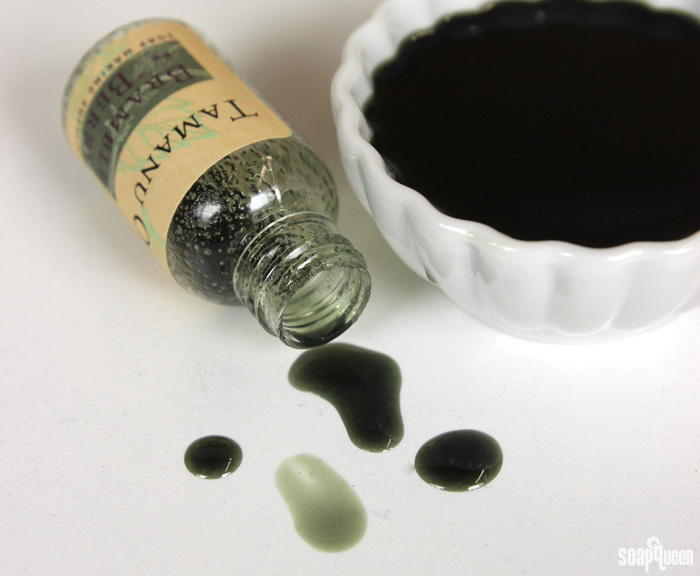 The tamanu oil is added at trace to give the soap all the skin-loving properties of the oil. 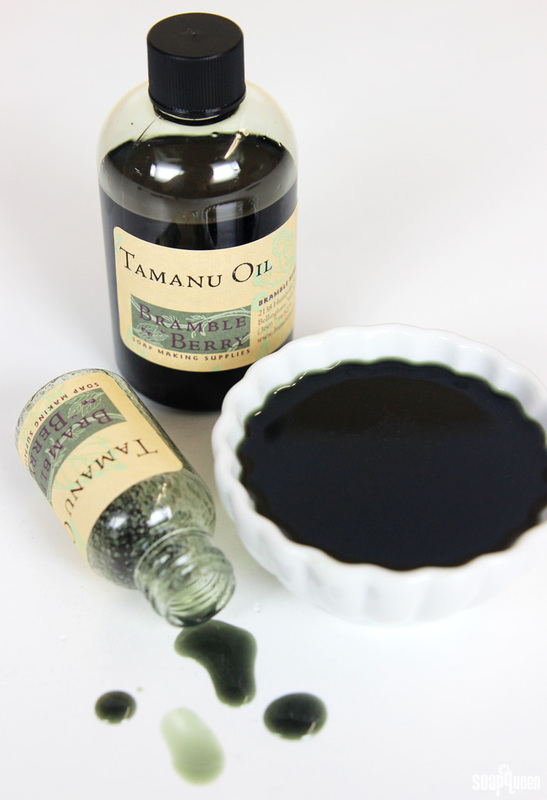 Because of its amazing skin benefits, tamanu oil is a popular choice for leave on products such as balms and lotion. In the Bramble Baby Belly Butter recipe, tamanu oil is added to a mixture of shea butter, mango butter, argan oil and chia oil to create a butter that’s perfect for pregnant and non-pregnant bellies alike. A small amount of tamanu oil is also used in the Whipped Coffee Butter recipe to add a rich scent and feel. If you prefer a balm texture, the Everything Balm is fantastic for a variety of applications including cuticles and stubborn dry spots like knees and elbows. 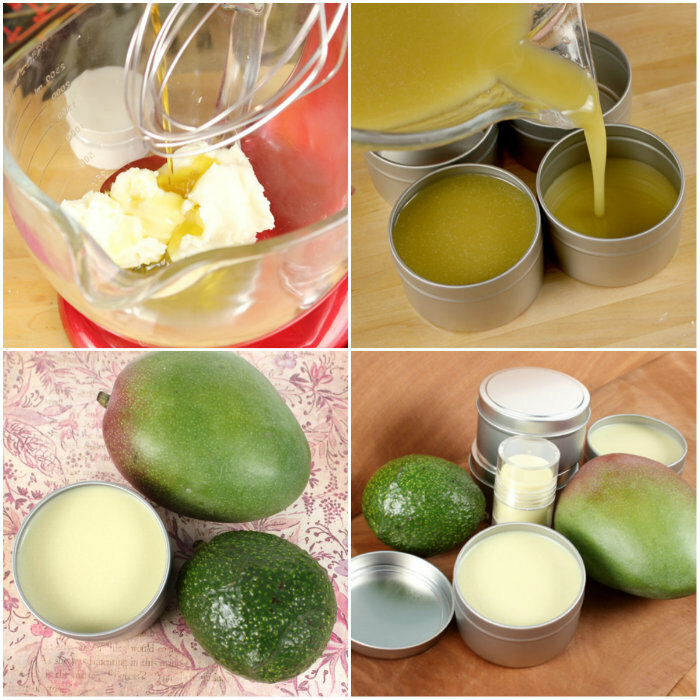 The Mango Avocado Balmy Salve also has a harder texture. It contains a small amount of tapioca powder to cut back on the oily feel. Why is it not put in with the regular oils, won’t the lye continue to react with the oil in the mold, even if it’s been put in afterward? Soap Queen, just wondering if you ever tried the Tamanu in a bath bomb recipe?! I’m thinking about giving it a try (or perhaps some hemp seed oil). Thoughts would be appreciated!! I so happy that I found this site. I going to start a small business making soaps, oils, and personal body care for me and my family and friends. I will make sure I stay in touch with you. Please send me any information that would help. Whoaw! I really like your blog. 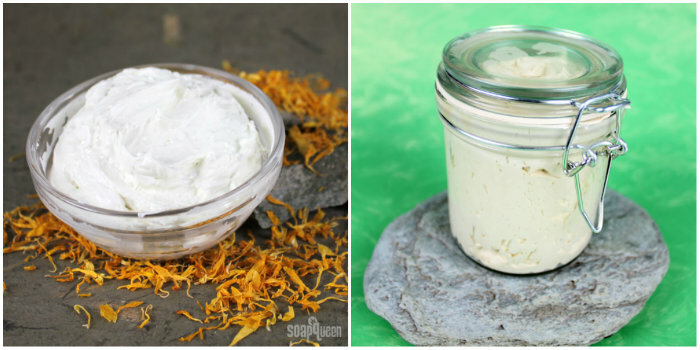 The way you showed pictures on how to make those balm and soap. Really love it! I’ve been using this oil for a long time. I would like to try this one. Thanks for this awesome blog! I learn so much from Bramble Berry. A new oil to try. I love the pictures, they let me know what I’m doing right and wrong. I have only been soaping since November 2014. Thanks You! I have a soap that contains 15% of tamanunoil. Tea tree, lavender and rosemary eos are added. It works wonderful for acne and eczema skin. Fortunately, I live in Vietnam, which located in southeast asia and my hometown is ‘house of tamanu tree’. It’s a wonderful oil in soapmaking. Some people can be sensitive to products they are allergic to, even on skin. I would recommend talking to a doctor to see if this oil is safe to use.